The revamped notes features Facebook began testing in August are now officially being rolled out. User-interface engineer Isaac Salier-Hellendag announced the overhauled notes features in a Newsroom post late Friday, describing ways in which users can customize notes and offering two examples. The notes update is available via the Web, with the finished products “fully viewable” via mobile. With this update, you can add a cover photo that represents what your note is all about. You can caption and resize photos and format your text into headers, quotes or bullets. For instance, you can recap your summer vacation or an important time in your life to update the people you care about. You can voice your opinion on something you saw in the news or write an open letter you want to share with the world. You can share a special recipe with a bulleted list of ingredients and photos of each step. Facebook has always been a place to share your thoughts with friends, and notes are a meaningful way for people to do that. For example, Jeff Nunokawa enjoys creative writing, and every day since 2007, he has written a note inspired by a different quote. With this update, Jeff has a better way of bringing his words to life and connecting with his friends on Facebook. 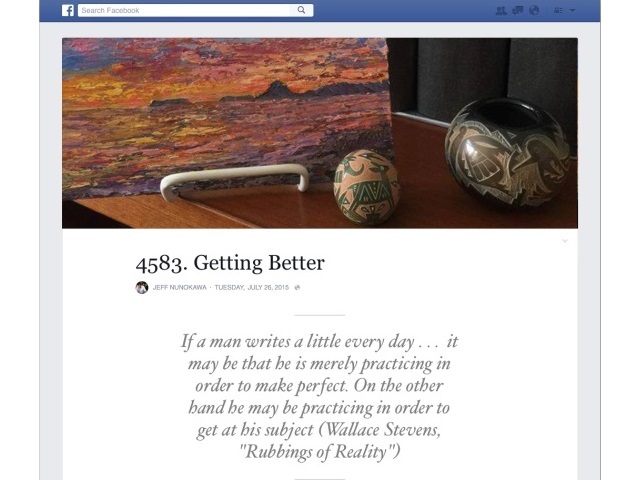 Readers: What do you think of the changes to Facebook notes?